In Ensure Enterprises, we are offering a wide spectrum of UV Curing Machine for PCB work to our valuable clients spanning all over the nation. 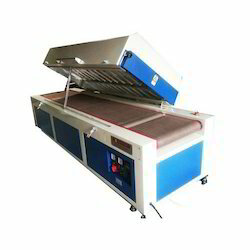 Widely praised for their high efficiency, these UV Curing Machines are used in domestic or local markets among our clients. The offered variety can be availed in sizes of 12", 15", 20", 25", 30", 32", 36", 40" and other such specifications as per variant market preferences. With IR and Hot Air System are also available in different sizes. We are into Manufacturing and Exporting high quality Semi Automatic UV Coating and Curing Machine. These machines are used for UV coating, paper coating, paper, board, plastic sheet, metal glass, any type of plane sheets, etc.